Bathurst; located an easy two and a half hour drive from Sydney, with its great facilities and with so much to see is a great place to visit. It is also an ideal place to hold conferences and major events. 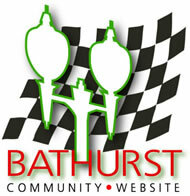 Read what one visitor to Bathurst had to say. The tourism and events section of this site provides a comprehensive guide to what's on in Bathurst (see the "coming events" section on the right) as well as providing quick links (below) to useful information and services for locals and visitors alike. For a list of places to stay and eat search our directory.